The 'deep space' theme of this year's competition season challenges builders to propel objects. Photo courtesy of THEBLUEALLIANCE.COM DBHS's Team Sprocket attended Orange County Regionals on Mar. 1-2 with a robot constructed by its members. The 2019 FIRST Robotics Competition season has been full of firsts for Diamond Bar High School’s robotics team, from new members to a new regional competition in Ventura. Team Sprocket placed 24th out of 49 teams at the Orange County Regionals on March 1-2, the first week after the six-week build season ended in the For Inspiration and Recognition of Science and Technology competition. “It was really surprising to see that a lot of the teams are still struggling and a lot of the strategies and cycle times are still being done to find the most efficient way to do it so it’s very different from a week two competition, where a lot of that’s already planned out,” said sophomore Kevin Tan, Team Sprocket’s Computer Aided Drafting and Design lead. 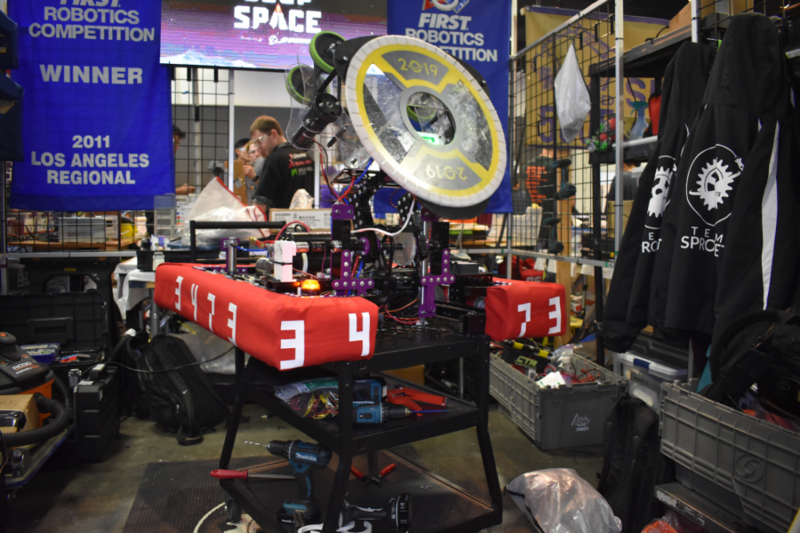 This year’s competition, sponsored by The Boeing Company, features the theme “Destination: Deep Space” and requires teams to create two four-robot alliances that shoot balls into receptacles of varying heights. There are other ways to earn points in the match as well, all of which require different mechanisms on the robot, such as a special intake to grab certain game pieces or an elevator system to lift the robot onto platforms. The team redesigned their bot midway through the build season. Although this set the team’s schedule back, senior co-captain Kenneth Song said that the change was necessary for strategic reasons. There are several ways for a team to advance to the championship round. Teams typically need to place in the Top 12 of a regional competition to then become alliance captains, or to be chosen by an alliance captain to compete alongside them. A team may also advance to the championships by winning the Chairman’s Award, which requires the team to make a video about their community service. During the Orange County regional, however, the team was not selected to join an alliance. Song recalled that in the last few matches, a portion of their robot broke down—an unfavorable spectacle to alliance captains. Because the Orange County regionals took place in the first week after build season, the drive team also had less time to practice with their robot before competing. In future competitions this season, such as the Ventura regionals on March 17-20, the team plans to have a new intake system, the part of the robot that picks up game pieces, in order to join an alliance and advance to the championships on April 17-20.